Not very common in Cuba, this paladar “La Carboncita” is run by an Italian, Walter. Pizzas and pastas fittingly adorn the menu as well as some meat dishes, but most regulars simply have whatever Walter suggests. 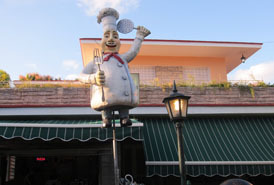 His recommendation is invariably simple, but this is undeniably the best place for pizza and pasta in Havana. I am not really sure what the secret ingredient is, but I do know that it includes a large dash of Walter’s charm, mixed with the freshest ingredients and a newly installed stone pizza oven. The place is basic in decor and ambience but offers a great atmosphere. Pleasant, comfortable, unpretentious with lightning-quick service, this is simply a good place to eat within a 200-year-old former monastery. People in the know return again and again because one hit is never enough.